From a pyramid created by a lost civilisation to a staircase built by aliens, Antarctica has been a hotspot for sightings by UFO hunters in recent months. Now, in their latest bizarre claim, alien enthusiasts claim they have spotted ET’s ship hidden in a cave in the South Pole. Their ‘discovery’, made from what they claim are Google Earth satellite images, was described as ‘final proof of secret technology’ on Antarctica. The claim has been made by a YouTube channel called Secure Team based in Cleveland, Ohio. They zoomed in on a mountainous region of the South Pole and found what they believe to to be a disc in a cave. ‘This is a bombshell discovery and one of the most obvious unnatural and anomalous structures we have found at the South Pole,’ Secure Team said. This follows another claim earlier this month that there is a giant staircase in Antarctica. An image has surfaced which is alleged to be a satellite image of the Antarctic, and believers in extra-terrestrial life claim it could prove aliens are visiting Earth. The picture was posted on a UFO and conspiracy theory forum. The image was posted online by an anonymous member on the forum Godlike Productions, along with a message. ‘This morning, in the work van, we were talking about conspiracies, and one of them were about so many big names going to Antarctica out of the blue,’ the message read. ‘I was bored so I pulled out Google Earth for a while, just exploring, when I came across something that looked like a giant staircase. Others offered more logical explanations, like an anomaly with the lens or snow dunes. Another image of a ‘dome’ in Antarctica sparked claims there was once a civilisation living in the frozen continent. 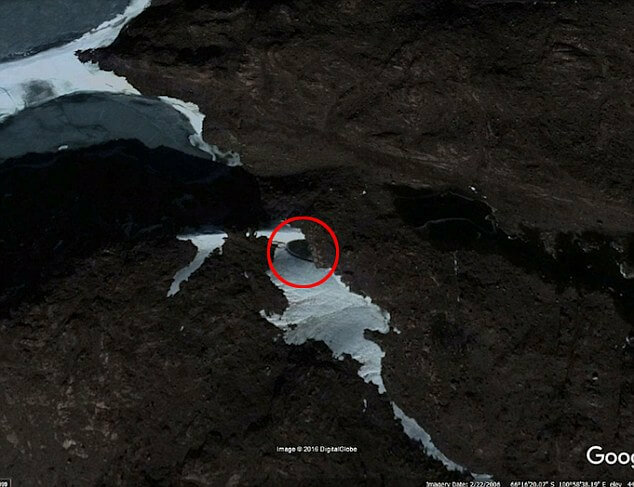 The picture, which was said to be from Google Earth, showed an oval-shaped structure that is believed be 400 feet (121 metres) across. Some claimed the structure is ‘evidence’ that a human civilisation once lived in the South Pole, while others said it may be a natural phenomenon. ‘What if, in the distant past, when Earth –and Antarctica— was much different then today, an ancient civilization developed there, creating fascinating structures, monuments and temples there?’ a post on Ancient Code says. The post says scientists initially thought the discovery could be a sastrugi – a natural phenomenon formed by years of battering by strong, freezing winds and heavy snowfall. Another strange theory surfaced last year, claiming that there is a mysterious pyramid in the Antarctic had emerged. Conspiracy theorists have posted a video on YouTube, in which they claim that US Secretary of State, John Kerry, visited Antarctica last week to visit an ‘alien base’ within the pyramid. The video suggests that the images have been taken from Google Earth, but it is unclear whether they have been edited. The video was posted by Third Phase of the Moon, a YouTube channel that regularly posts conspiracy theories on aliens. It showed a pyramid-like structure in the snow, with a Google Earth-type label and pin. The label reads ‘Antartica Pyramid’ – a misspelling of Antarctica, which suggests that image might have been doctored. It is unclear what the structure could be, but it looks similar to a nunatak – a natural mountain peak that juts up above glaciers. Nigel Watson, author of the UFO Investigations Manual, told MailOnline: ‘Pictures of the pyramid structures are either photoshopped, cropped pictures to make the mountains look more like pyramids or simply pictures of natural formations called nunataks. Pyramids are often an area of interest for conspiracy theorists. In October last year, a video posted on YouTube claimed there was a crystal pyramid beneath the Bermuda Triangle, which was to blame for the disappearance of several planes and ships in the area. Mr Watson added: ‘There is always a mystique about pyramid structures.